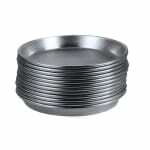 The American Metalcraft ADEP6 pizza pan is made of 18-gauge aluminum, which is durable and corrosion resistant. It has a 6-inch top diameter, a 51⁄4-inch bottom diameter, and a 1-inch depth. Light enough to lift and carry, it has a standard weight and can stack to save storage space. We cover pizza pans in the guide for pans and screens.